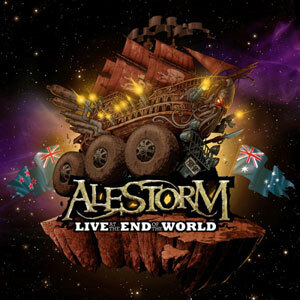 Alestorm have released their first live DVD – Live at the end of the world. Handily released in time for Christmas shopping, the DVD was filmed on their Australian tour at the start of this year. Presented in a nice hardback digi-book style case, you get a DVD and a CD for your money. The main feature is of course the concert footage – around an hour and a half of Alestorm live in concert with all the fun and lunacy that entails. Great catchy songs about pirates, alcohol and women with a great sense of humour. The video footage is good with several camera angles, and the sound quality is excellent. It’s a great live DVD. Then of course we get some bonus features including Alestorm’s cover of “In the Navy”, and the almost mandatory tour documentary to go with the live footage. It’s around 45 minutes and includes a few minutes of seriousness (the promoters talking about working with Alestorm) as well as plenty of footage of the band’s off-stage time in Australia. It’s certainly well worth watching. The CD is the same songs as the DVD. It’s a nice touch as most people tend to listen to music more often than they watcha DVD, so with this package they get the best of both worlds – a DVD to watch when they want to relax in front of the TV, and a CD to listen to the rest of the time. An essential purchase for all Alestorm fans, and if you’ve got an Alestorm fan in the family this would be a perfect Christmas gift for them.